If your hair is in need of a serious deep conditioning treatment, look no further than coconut oil. Great for shine, it helps repair damaged and brittle strands while combating frizz. Use a coconut mask once a week for luscious locks. Coconut oil is rich in lauric acid, a fatty acid with antimicrobial, anti fungal and antibacterial properties, so it works wonders on cuts and burns. It can also help treat athlete’s foot and other fungal or yeast infections. Dab a little on a cotton ball and gently wipe away the day’s mascara and other eye makeup. Because of its hydrating properties, it works while you sleep to condition eyelashes and nourish the delicate skin under your eyes to reduce puffiness and wrinkles. Due to its high saturated fat content, coconut oil remains stable at high temperatures for cooking and will not turn rancid like other cooking oils. It is cholesterol-free and has been shown to help lower cholesterol levels and support thyroid health. Perfect for the vegan baker, substitute butter and vegetable oil with coconut oil as a healthier alternative when whipping up sweet treats. With the ability to mimic butter, it adds a sweet hint of coconut to frostings, cakes and cookies. Composed of medium-chain triglycerides, coconut oil is used as a source of fuel in the body as opposed to being stored away as fat. This boost in energy shifts metabolism into high gear to increase the rate at which calories are burned. Ditch your old shaving cream and lather up with coconut oil for a nice, close shave. Your legs will appreciate the extra nourishment and moisture. It also aids in the exfoliation of dead skin, leaving you with soft and supple legs just in time for summer. 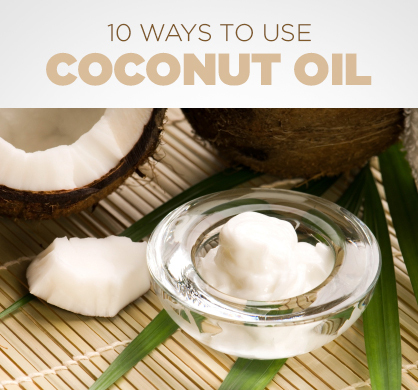 Use coconut oil around the house in place of toxic household products loaded with chemicals. Polish wood furniture or brass for a fresh finish, season cast iron skillets or use it in place of WD-40. Get your body beach ready by mixing coconut oil with brown sugar for an allover body scrub. This nourishing exfoliator will leave your skin baby soft. Mix with sea salt for a coarse scrub for feet! Coconut oil inhibits the growth of bacteria that can cause tooth decay. It also facilitates absorption of calcium by the body and helps teeth stay strong. Look for natural oral hygiene products with coconut oil or try oil pulling to prevent gingivitis, gum bleeding and cavities.